Here at Chemstore we would all like to wish you a Happy Christmas and a Prosperous New Year. 2017 has been an exciting year for Chemstore as an organisation with key goals achieved and challenges overcome. As the year draws to a close we are looking forward to the holidays and have already some very exciting projects planned in early 2018 as we enter our 25th year in business! Solutions for a global marketplace: Testament to Chemstore’s ongoing product development and improvement initiatives is a growing blue chip client base in locations across the globe and appointment of partner distribution companies in both Norway and Sweden. Bespoke Project Portfolio: This year we have once again constantly worked with our clients to develop bespoke site specific solutions to drastically reduce risks on site with hazardous materials. We are excited to be launching a new product portfolio of newly designed solutions. Keep an eye on our case study page. As we reflect on the year 2017, we realise that it is clients, like you that make reaching our goals possible. Working together with you, we have strived to achieve our goals and would like to thank you for your custom and input. 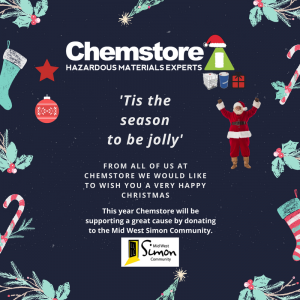 Chemstore is proud to donate to the Mid West Simon Community and look forward to getting involved in further fundraising events and campaigns in 2018.